Dies R Us: Just a Note! I hope all of you have been enjoying the summer and enjoying all the amazing creative cards our design team has been sharing! If you have, we would love to hear your feedback! Or if there are types of cards you would like more of, please let us know that as well! For my card today, I chose an adorable digi image from Tiddly Inks, pulled out some of my favorite "go-to" dies and in no time at all, I had a great card to send to friends. 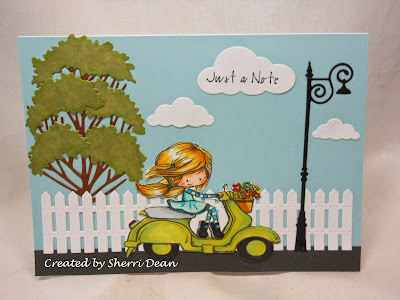 I used the following dies: Taylored Expressions Picket Fence, Poppy Stamps Antique Lamp Post, Memory Box Puffy Clouds, Dee's Distinctively Tree Base 2 and Dee's Distinctively Tree Toppers. When you have the basic background dies, you can easily assemble an adorable card & you will use these dies time after time. By just fussy cutting my image out after I colored her, I could create a complete scene. Enjoy the rest of your week! Spend at least a little time creating something wonderful! It's good for the soul!